J.K. Rowling's The Casual Vacancy: The Reviews Are In! "Much of the book I admired, even if I didn’t love. There were sentences I underlined for the sheer purpose of figuring out how English words could be combined so delightfully. There were incidents I immediately reread because the developments were surprising or genuinely moving. There were characters that I liked, then disliked, then liked again with reservations." The New York Times: Now We're Just Being Downright Mean and Using Bizarre Words Like "Limned"
"It’s easy to understand why Ms. Rowling wanted to try something totally different after spending a decade and a half inventing and complicating the fantasy world that Harry and company inhabited, and one can only admire her gumption in facing up to the overwhelming expectations created by the global phenomenon that was Harry Potter. 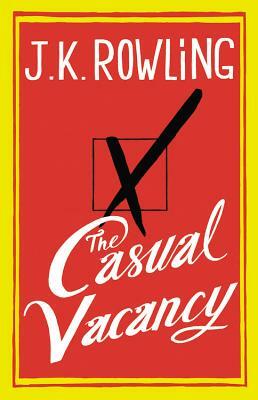 Unfortunately, the real-life world she has limned in these pages is so willfully banal, so depressingly clichéd that “The Casual Vacancy” is not only disappointing — it’s dull." "Would this book be published if it weren't for the name on the cover? Almost certainly. Would anyone pay much attention to it, and its message? Probably not. Is it worth reading? Yes, because it's become a talking point among readers, and unlike "Fifty Shades of Grey," reading it is not a painful experience. Is it worthy of awards? Probably not, but I'd definitely be interested in reading her next book, regardless of the baggage carried by the name on the cover." "The Casual Vacancy is no masterpiece, but it's not bad at all: intelligent, workmanlike, and often funny. I could imagine it doing well without any association to the Rowling brand, perhaps creeping into the Richard and Judy Book Club, or being made into a three-part TV serial. The fanbase may find it a bit sour, as it lacks the Harry Potter books' warmth and charm; all the characters are fairly horrible or suicidally miserable or dead. But the worst you could say about it, really, is that it doesn't deserve the media frenzy surrounding it. And who nowadays thinks that merit and publicity have anything do with each other?" So far, I have yet to see a single review from someone who loved the book (Bueller?). I'm still planning on starting in on it this weekend, and I'm participating in Brenna at Literary Musings' Casual Vacancy Readalong. Who else is planning to read it? Skip it? If you've read it already (and bravo, speed-readers! ), did you love it? Hate it? Huffington Post: Will I write this review by way of asking myself questions? Yes. Will this get annoying? Most definitely! Do I keep it up? Of course. Also 'limned'. What now, NYT? This is a book I think I really look forward to reading blogger's reviews instead of "real" reviews. Hahahaha, the HuffPo review is a LOT of questions, and it does get very annoying. I, too, am looking forward to blogger reviews of this one. Silly embargo! I really have to read this book. It really appealed to me. I just got it from the library and started it yesterday. It's as bleak as I expected it to be (as per the reviews described it), and I'm sure I wouldn't have picked it up had it not been for the author, but I'm going to stick it out and see how I like it. I read the New York Times review accidentally, and seriously? I do not understand what the deal is. It's really not a good-quality critical review, but rather something bordering on unkind and taunting. I know this happens every time a well-hyped book comes out, but it's frustrating. Perhaps as a Harry Potter fan, I'm taking it more seriously than I should...?